All of this ran through my own aging mind last week when I came across a news item about a company trying out robots as companions in a senior care facility. Certainly, loneliness is a contributing factor in the deterioration of health in older people. And certainly a robot is better than no companion at all, but some senior facilities have adopted dogs, cats, and birds to cheer lonely seniors and perhaps prolong their good health. The senior people I have been close with would all prefer a pet goldfish to the sort of companion you see in the above photo. Perhaps this humanoid machine contains natural language and facial recognition: it may even recognize your grandmother’s face and be able to pronounce her name. Perhaps it will patiently listen to her stories as she tells them over and over again, while you will not. But the robot, I wager just won’t be able to gaze into aging eyes with sympathy and understanding. Holding its hand or enjoying the warmth of a hug just won’t be the same as a human companion: it won’t even match the attention doled out by an apathetic cat. 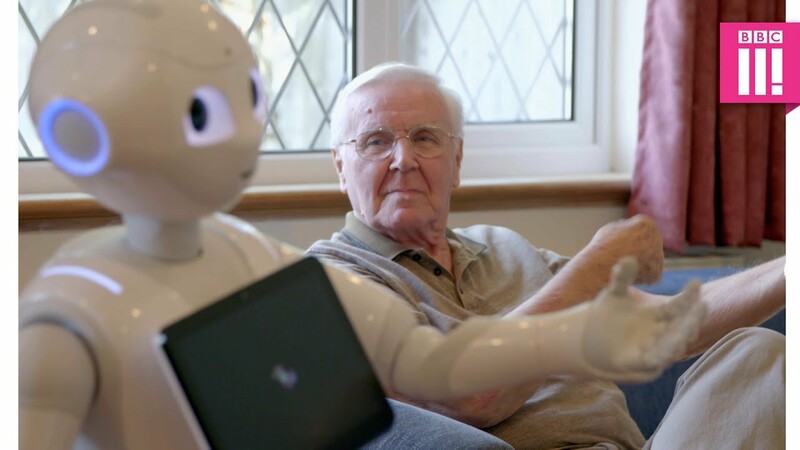 Perhaps, this robotic companion bothers me so more today than it would on other days, but as I write this, my wife Paula Israel is visiting her 98-year-old mother in a senior citizen home, where hospice will be visiting for the first time. Hospice, if you have aren’t familiar with them, make the final journey in the last phase of life more comfortable for the patient and easier for those who love her. I’m sure the people who envision this eldercare robot are well-intentioned. And yes, I have seen Robot and Frank and Marjorie Prime, two gentle and brilliant works of fiction, but I just don’t think it will work that way in real life at least not until we have completed what is left of this century. This example leaves me thinking about an older work of fiction, Aldous Huxley’s Brave New World where an authoritarian government used advanced technology to build a Utopian society that turns out, of course, to be something less than that. What the elderly need the most is human kindness: the only source of it for the next 100 years or longer is likely to be humans. people to care for people, robots to make the things that humans do worse. Having an efficiency mindset based on machines enriches the economy.